Obituary for Carol Louise Block | Sierra View Funeral Chapel & Crematory, Inc.
Carol Louise Block: departed this earth on Saturday, January 19, 2019. She lived for 90 years, 4 months, and 1 day. Carol was born (September 18, 1928) and raised in the small village of Livonia Center in upstate New York. 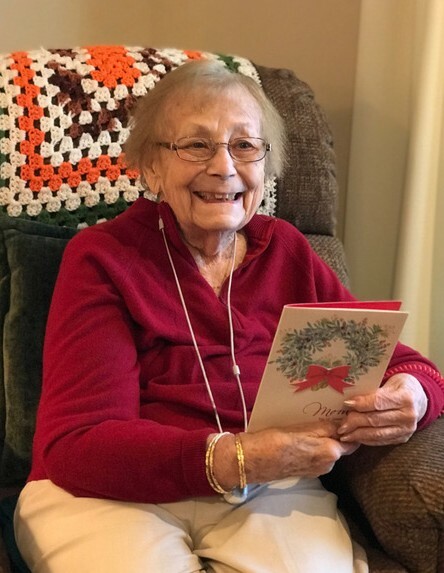 Her parents, Karl and Emma Osborne, enjoyed a country life, and Carol spent many years feeding the chickens, pulling weeds in the garden, and canning meat and vegetables. Her life was focused on her family, church, and the local community. During her youth, she spent many Saturday evenings roller skating with her younger brother Lynn at the rink on Conesus Lake. On Sunday mornings you would find her faithfully playing hymns on the piano for the worship services at Livonia Center Presbyterian Church. As she matured, Carol felt called to dedicate herself to becoming a grade school teacher. With that goal in mind she attended the Fredonia State Teachers College and received a Bachelor of Science degree in Music. She was the first member of her extended family to graduate from college—her parents were so proud of her achievement! Over the years she taught grade school in New York, Virginia, North Carolina, Florida, and California. Conducting choirs was a special interest, and she led both adult and children choirs in several schools and churches. Moreover, she played many instruments: piano, flute, clarinet, organ, autoharp, banjo, guitar, violin, trumpet, and the drums. Carol married her first husband Mitchell Jay Serven in 1951 and later gave birth to a son, Marcus Jay Serven. Sadly, this marriage ended abruptly in 1959. Through her extended family, she was introduced to a fine man who would become her second husband, Henry Herbert Block. They married in 1961 and were blessed with a son, Carl Henry Block. Both boys were encouraged to excel in their education: after college and seminary Marcus went on to become a Presbyterian Minister and chaplain, and after attending the U.S. Air Force Academy Carl became an officer in the Air Force and later an attorney. What was her character like? Her two sons agreed on the following description, “Mom was independent, persevering, driven, and focused, but she was also very tender—especially to us, and to her grandchildren.” Carol excelled at music of all types and she could play just about anything on the piano (with or without the sheet music). She also enjoyed painting and produced beautiful pictures that decorate the homes of her family members and others. Carol and Henry lived for many years in Carmichael, CA. In their retirement, they traveled throughout the United States, Canada, Europe, Asia, and Central America. They also spent a decade living with other retired military families at Paradise Valley in Vacaville, CA. After Henry’s death, Carol returned to Sacramento, CA where she lived out the remainder of her life in close proximity to her son Carl and his family. The last few years, she enjoyed living at Oakmont Retirement and Assisted Living Facility in Carmichael. Carol was preceded in death by her husband of over fifty years, Henry H. Block. She is survived by her two sons, their spouses, twelve grandchildren, and fourteen great grandchildren. She will be interred at the Sacramento Valley Veterans Cemetery in Dixon, CA.